Originally I though that my password did in fact violate my FGPP, but after testing this further I concluded that it was something else. After a bit of looking I discovered that this domain was in Windows Server 2003 Functional Mode. A requirement for FGPP is at least Windows Server 2008 Functional Mode. After changing it to Windows Server 2008, the FGPP took effect and I could reset my passwords. Perhaps the *-ADFineGrainedPasswordPolicy cmdlets should check the domain functional level. At least New-ADFineGrainedPasswordPolicy should display a warning if the domain is not at the required level. The requirement is listed in the Step-by-Step guide (thank you PTS), but I didn’t catch that this time. I love Spotify, but recently I have been plagued by poor sound quality. Specifically I experienced clipping, popping and variations in volume level during playback. As far as I could tell this affected all the songs I played in Spotify. 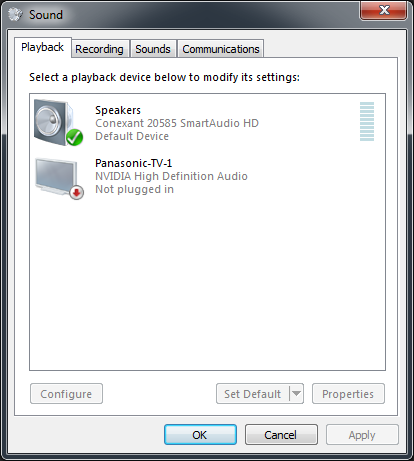 At first I thought the problem was specific to Spotify, but after doing some tests with Grooveshark and Windows Media Player I discovered that the problem affected all apps playing sound. After a little digging I discovered a workaround for the problem. 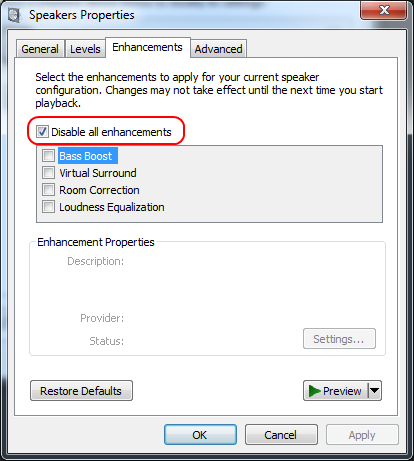 Select Disable all enhancements. If you are playing music it will momentarily pause and then continue, hopefully (as it did for me) with now crystal clear quality. Unfortunately none of these support more than RDP v5.1, which do not offer any of the newest features such as multi monitor support etc. 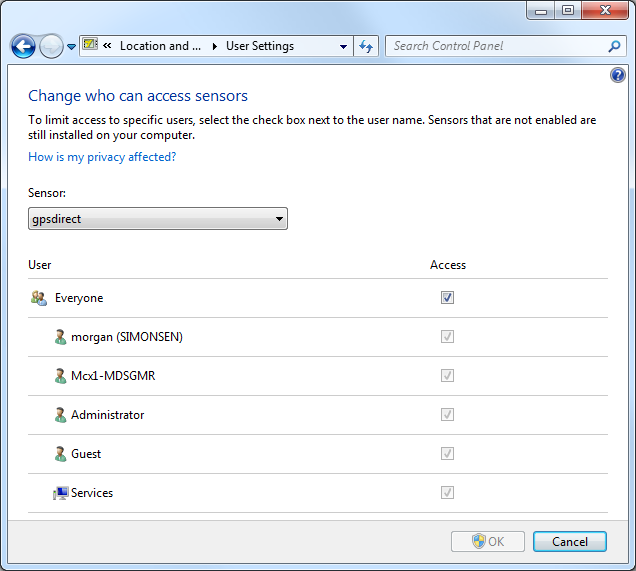 Remote Desktop Connection (RDC) has a Group Policy setting that determines which publishers are to be considered trusted when launching connections (typically .rdp files served in various ways). This policy setting allows you to specify a list of Secure Hash Algorithm 1 (SHA1) certificate thumbprints that represent trusted Remote Desktop Protocol (.rdp) file publishers. If you enable this policy setting, any certificate with an SHA1 thumbprint that matches a thumbprint on the list is trusted. If a user tries to start an .rdp file that is signed by a trusted certificate, the user does not receive any warning messages when they start the file. 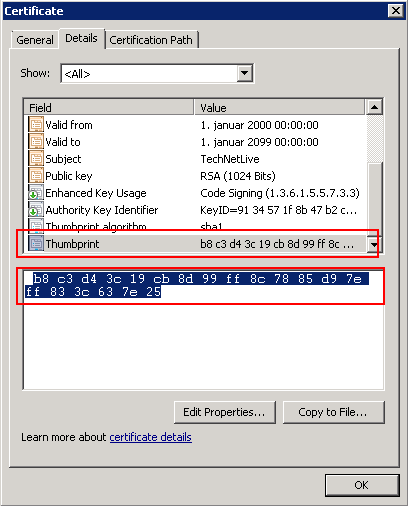 To obtain the thumbprint, view the certificate details, and then click the Thumbprint field. If you disable or do not configure this policy setting, no publisher is treated as a trusted .rdp publisher. 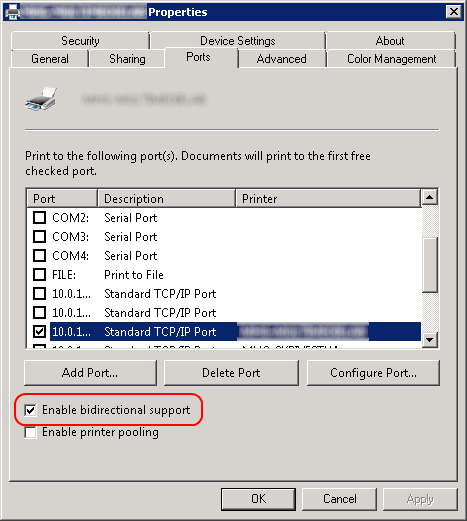 You can define this policy setting in the Computer Configuration node or in the User Configuration node. 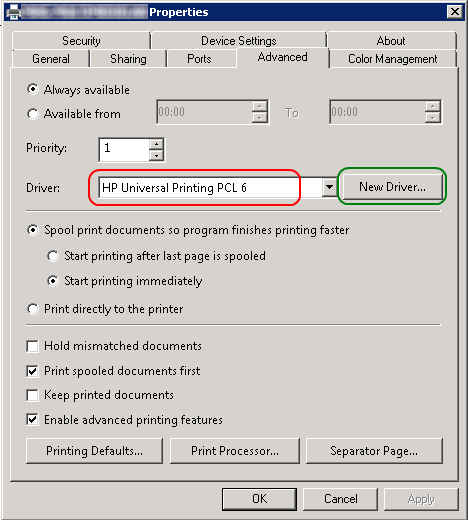 If you configure this policy setting for the computer, the list of certificate thumbprints trusted for a user is a combination of the list defined for the computer and the list defined for the user. This policy setting overrides the behavior of the "Allow .rdp files from valid publishers and user’s default .rdp settings" policy setting. If the list contains a string that is not a certificate thumbprint, it is ignored. As you can see; no mention of how the thumbprint is to be entered! I found out the hard way that you have to remove all spaces and convert all letters to uppercase for the thumbprint to be valid. You are not informed if the format you enter is incorrect, it is just silently ignored if not recognized as a valid thumbprint. 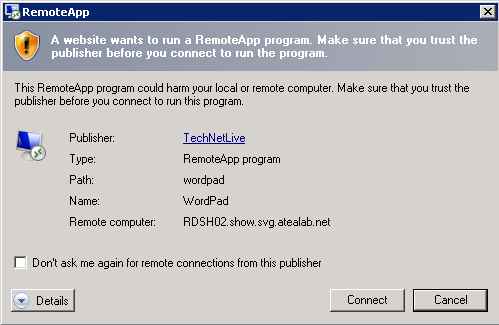 Error: A website wants to run a RemoteApp program. Make sure that you trust the publisher before you connect to run the program. I do not know what character this is, but it invalidates the thumbprint string if you paste it into the SHA1 thumbprint field in your GPO. Even stranger is that it does not show up in the pasted text in the GPO object; it just “looks” right. As I said, I have no explanation, but remember to skip the leading whitespace when you copy your thumbprint. 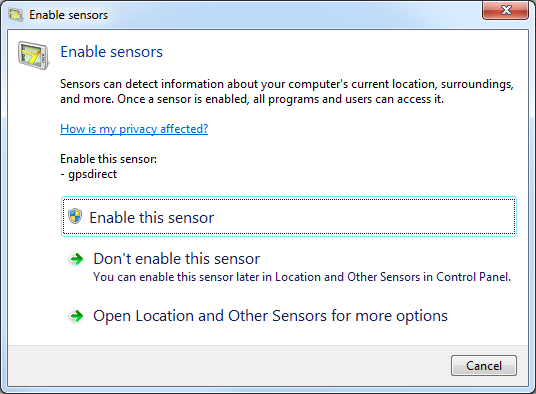 Windows 7 has a new framework; the Windows Sensor and Location Platform. In short it is a system that enables the OS to utilize different sensors; e.g. a GPS device to track your location, a light sensor to dynamically adjust your screen brightness based on the ambient lighting, an accelerometer to use for games etc. I want to focus on GPS in this post. 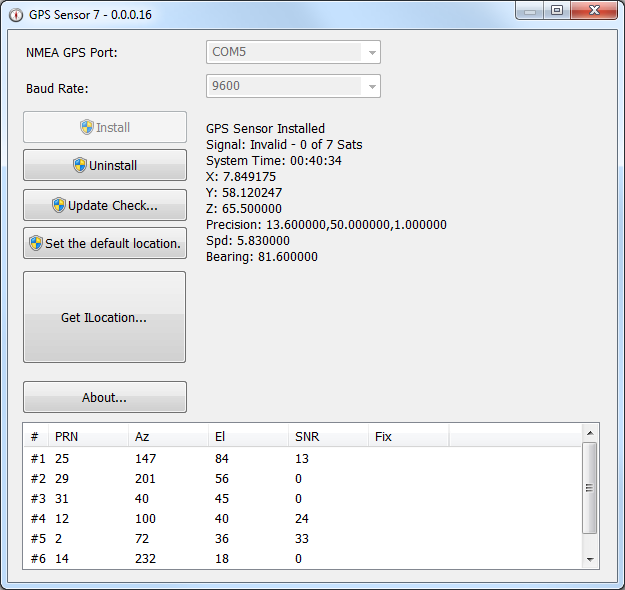 Up until now; the usual way to connect a GPS device to your computer was for it to emulate a COM port and then send standard NMEA GPS data to the port at a specified baud rate. This worked OK in my opinion, but with the new framework the GPS device, or sensor, is exposed directly to the OS. No more intermediary COM ports. This works the same for any sensor, by the way. As of this writing, there are very few devices compatible with the new framework out there. I only know of the USB GPS Devices from ublox. To work around this you can use Michael Chourdakis’ excellent GPSDirect driver that acts as a layer between a legacy GPS device that sends NMEA data through a COM port, and the Sensor and Location Platform. You can now close the GPSDirect software. The driver will remain loaded until you remove it. Note: There is an issue with the current version of GPSDirect, v 0.0.0.16, in that it does not reconnect to the COM port if the GPS is disconnected or turned off. Unfortunately there are very few applications that are able to use the location information a GPS device can provide. In fact I know of only one; the Windows Weather Desktop Gadget! 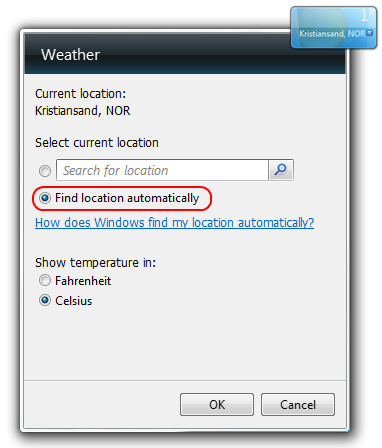 If you add this gadget to your desktop, and have a your GPS working, it will automatically detect that your computer is “location aware” and try to automatically find the weather forecast for your location. Notice the little “signal” icon in the gadget. This indicates that the location was determined by using the computer’s location framework. If you do not own a GPS device but still play around with the location functionality, you can try the GeoSense application. What GeoSense does is that it uses a hybrid mix of geolocation service providers and geolocation methods to pinpoint your location as accurately as possible. It currently supports Google Location Services (WiFi) and Google Location Services (IP), with several more under consideration. 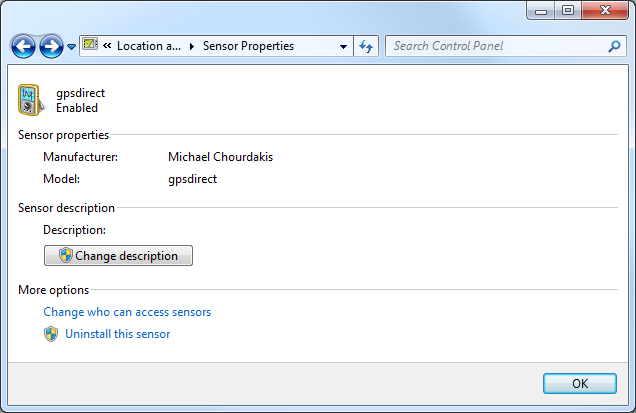 GeoSense is written natively for the Sensor and Location Platform so you just have to install it to use it. After installation you will have a new sensor in you Location and Other Sensors applet, which can be configured in the same way as GPSDirect (or any other location sensor). GPS is just one of many applications of the new framework. Especially for games I think we will see a whole new group of controllers that utilize the new API. One example of this is a driver written by Rajasekharan Vengalil, that lets you use the Nintendo Wiimote with Windows 7! Check it out here.